If you want to know what it was like to sit in one of the richly panelled state rooms of the tragic Titanic, the opportunity will soon present itself at a hotel in the Irish midlands, more than a century after the great liner sank. “It is like sitting in the lounge of the Titanic, it is the exact same cabinet makers and artisans who carved it” says Niall Mullen who is about to sell two sets of ornate panelling that come, not from the most famous ship in the world, but were made at the same time by the same carvers in Belfast for its sister ship, Britannic. The seasoned maple and oak fashioned into the ship’s First Class Stateroom and Second Class Library at the Harland & Wolfe shipyard around 1912 is believed to come from wood that was felled in the late 1870s and seasoned for 30 years. How it survived in Ireland for so long is almost as incredible as the sinking of the Titanic by an iceberg in the middle of the open waters of the Atlantic Ocean the same year the Britannic was under construction in Belfast. 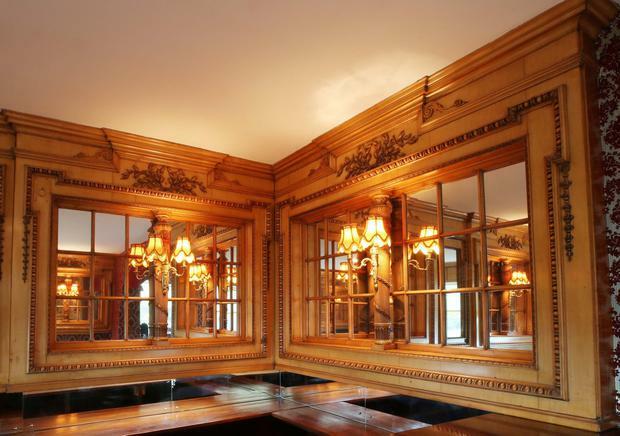 The two wood panelled rooms, one of which has been erected in situ for a Niall Mullen auction at the Heritage Hotel, Killenard, Co. Laois on May 1st and 2nd and the other which is still in a private house in Dublin, could sell for an estimated €500,000. 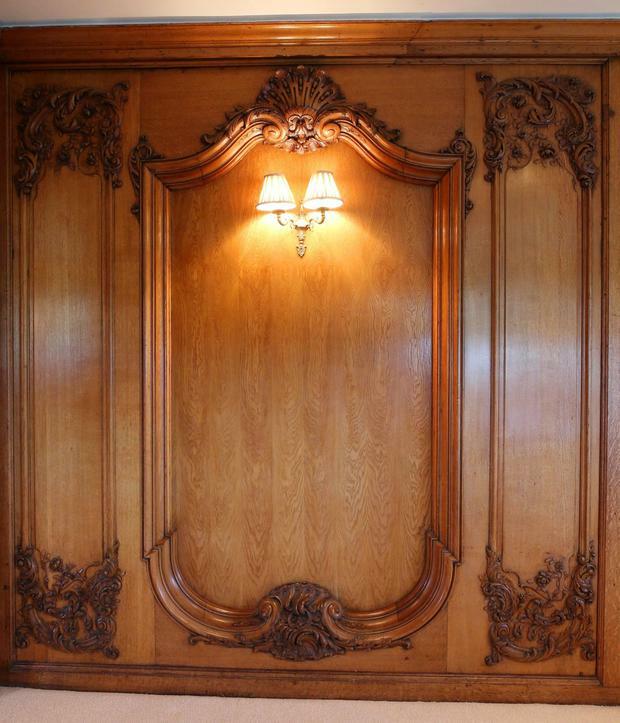 The first class lounge panelling in richly carved polished oak has a guide price of €250,000 to €350,000. 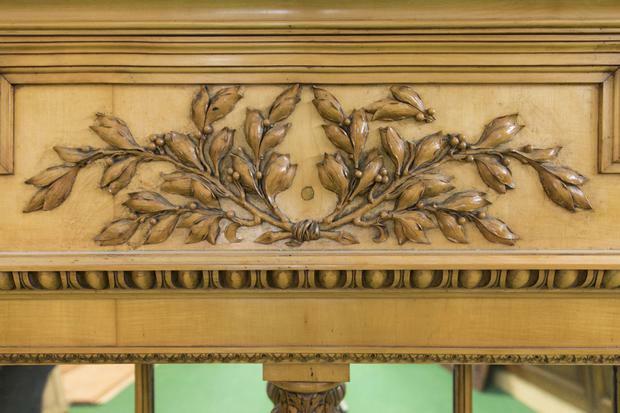 The second class library is panelled and framed in maple and comes with a mahogany bar with copper “embelishments” carved in the Adams-style, and has a guide price of €200,000 to €300,000. “We have reconstructed the second-class library in Killenard, with viewing from April 26 to 29, while we can arrange private viewings of the oak first-class lounge” says Mullen. The Britannic was launched in 1914, two years after the ill-fated Titanic, but was requisitioned soon afterwards as a hospital ship by the British government and the ornate panelling was either never fully installed or taken-out. In 1916 on a mission to the Balkans it hit a German mine and sunk in the Aegean Sea. The wreck was discovered by the legendary underwater explorer Jacques Cousteau 59 years later. The fitting and furniture were auctioned in Belfast in 1919 and an enterprising Dublin theatre owner bought 25 metres of the richly carved panelling for his new 1,900-seater La Scala Theatre & Opera House in Princess Street, Dublin, which opened on the 10th of August, 1920 just off O’Connell Street. It converted into the Capitol Cinema in 1927 when Paramount Pictures took over the lease and the Britannic woodwork was still in place in 1972 when it was demolished to make way for the first BHS, now the flagship Penney’s department store. “A salvage merchant in the city at the time probably saved it from being dumped, like so many other treasures,” said Niall. It was bought from him by a businessman who panelled two rooms of his home in west Dublin where it has been ever since. “Simon Mills, who owns the wreck of the Britannic somehow tracked it down and it is shown in his book” says Mullen, who also discovered the ship number, 433 and the Harland & Wolfe number on the back of the panelling, although he never doubted that it was the real thing. It was carved to a design by Arthur Henry Durand, who also worked on the Eiffel Tower in Paris and matches the fittings installed in the other White Star Line ships like the Olympic and the ill-fated Titanic. Other parts of the paneling have been installed in houses in Belfast, but the Mullen auction lots are by far the most extensive pieces to come up for sale. Also going under the hammer in the two-day sale at The Heritage is the original share register and other documents from the iconic Shelbourne Hotel, which were found in a skip, documents from the opening of its cocktail bar in 1944 and an original fanlight from the reception area. He will also be selling an “amazing” curiosity cabinet from Lissadell House in Co. Sligo and a rare collection of Spy cartoons. Fixtures – including two Murano chandeliers from the Dylan Hotel, the grand piano from the Burlington Hotel and a bar from the former Residence Club in St. Stephen’s Green as among the extensive items in the auction catalogue. The auction will take place on May 1 and 2 at 11am. Viewing April 26-29 (10.30-6pm). Contact Niall Mullen 086-2575988. Online bidding available at victormeeauctions.ie. See: titanicsisterauction2019.com for more details.